Would inferring tags from a question's title and body and filling them automatically into the tag field (or at least suggesting them separately as a hint list or something) be worthwhile? Note that I'm not referring to the tag auto-complete that goes on already, mind you. Edit: The way I see it, it's the people who struggle defining their problems who probably need the most help with getting them solved. That's what I'm implying with this question, just so you know. Perhaps next to the tag box there could be a "Help!" button - it would display a little box with a short description about tagging, and some suggested tags..
"Recommended" are tags I've used before, that other people have also used for the URL, "Popular" are ones I may have not used, but are the most common for the URL. Natural language processing is a very complex thing, one can only determine to certain degree what the most reasonable tags would be. To do this would take a lot of resources. You should know fully well what type of tags your question involves when you ask it. Trying to get a computer to do this for you is lazy for those who use it, and complex for those who make it. Not to mention the large disadvantage caused by mis-tagged items. On top of what Ian said, i'll theorize that most folks capable of writing a decent title and body are also perfectly able to fill in some decent tags. While those unable to properly tag a question are probably also not asking very good questions. The SE Tag Suggestions userscript from here, written by @HodofHod, does this. It adds a "suggest tags" link below the tag textbox, with options to suggest based on your tags (what do you tend to ask about) or based on similar questions. I've found that it does a pretty good job on the sites I use most. An excellent suggestion. If delicious.com can do it, so can SO! I seriously suggest you just copy the same UI delicious has - it's perfect. ok, for example, what would the "suggested tag" output be from this very question you asked? The limitations of this method are so severe that the negatives outweigh any positives. This has come up before on UserVoice and I've declined it for the same reasons. "Hai. Wy pHP an't rendrn my dataah? I has the varible n echo. KTHXbai"
Then again - perhaps the result from the process could send off a short comma-seperated list of the resulting keywords to be processed. Only the ones that actually exists as tags would be returned. Not the answer you're looking for? Browse other questions tagged feature-request status-completed tags suggested-tags . 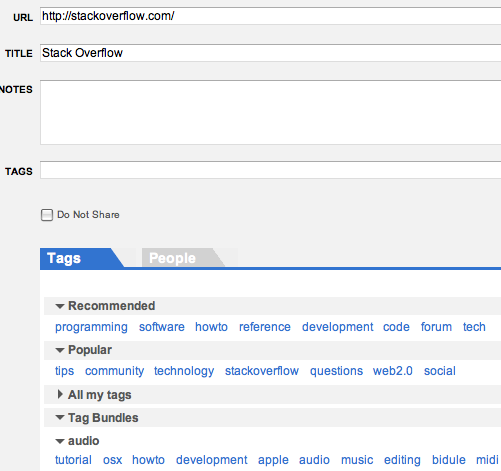 Why doesn't Stack Overflow automatically recommend labels or tags? Can a suggested tags feature be added? Suggesting tags based on question body and title is fluffing sweet. Can we have this on SO?